Typical of police in Central America: a checkpoint in the middle of nowhere. A demand for “pasaporte,” more often than not followed by the demand for money. Gringos and Canadienses in large vehicles are not the only target; taxi drivers, ordinary Latinos who have very little money get the same treatment if they drive on Central American highways. After a while, the pattern becomes familiar. The exception is Panama, where I have yet to be asked for a bribe. Let me tell you how I avoid these situations with police in Central America every time; it's easy and it can save you a lot of money. First, I deliberately avoid using my baby-talk Spanish. Not a word; everything in English. This gives me two advantages: very few police in Central America or Mexico speak English, so they are at a loss when someone chatters away in a language they don’t understand. Secondly, it is assumed I don’t know what they are saying. That’s not enough by itself, but being a travel writer helps. I keep a small notepad and a pencil within easy reach. I then beckon the policeman forward so I can read his nametag, making it obvious that I am writing down his name. This, as one might expect, brings instant alarm. In an amusing game of role reversal. 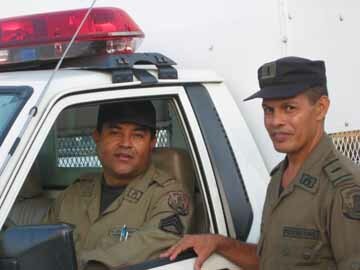 Police in Central America are immediately on the defensive. I am on my way within five seconds of indicating I am a writer doing travel stories. One female officer was still actually apologizing profusely when I was already 100 yards down the road. 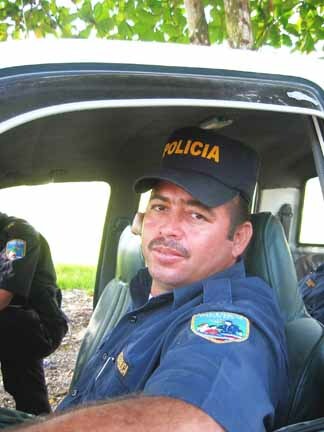 The locals, unfortunately, don’t have such an easy way out when dealing with police in Central America. Anyone can say he or she is a travel writer. There is no special badge or license required, no credentials, not even a letter proving you are what you say you are. A letter home could class as travel writing! The strategy never failed me, and I was never asked for details by any of the police in Central America. That’s not to say I never paid money, but I never paid money to police in Central America unless they first did something useful for me. In the early hours of one morning in Mexico City, I was completely lost. For the second time I passed two police cars, their occupants chatting idly. Within minutes of asking for help there were five cars, their occupants standing in a tight circle arguing about which would be the best route to take out of the city and which one of them I should follow. It’s a wonder I was not arrested: I could not help but laugh aloud at what struck me as a hilarious scene, each officer defending his position (and honor?) with such vehemence! Finally, one emerged victorious and I was instructed to follow as he led the way, roof lights flashing. In the rearview mirror, more lights flashed. I felt like Mexican president Vicente Fox! I was so impressed with this dedicated treatment that I promised myself right then I would write an article extolling the virtues of Mexican police and the fact that I was not asked for money. We pull over to the side of a road and the officer in the following car approaches mine. “Money,” he says simply, hand out, forefinger and thumb rubbing together in what I later came to recognize as the universal sign among police in Central Amercia. Only when I had paid far more than I would have guessed was I taken the remainder of the way to the road that I needed to get out of the city! Oh, well! They had probably saved me hours and a considerable amount of gas! My final brush with police in Central America resulted in a friendship and major assistance in settling into Panama City. I was at the end of a solo drive from eastern Canada. It was dark, it had been raining, and the headlights in the middle of the city were dazzling. Once again, I was lost. I pulled in beside a policeman directing traffic in a busy area. To my surprise, he left his post and proceeded to draw a map for me on the back of an envelope. The road he drew was straight and showed three sets of traffic lights. I was to turn right at the third set. Simple! I went in the direction he indicated. A car on my right veered right before I had even reached the first lights. I kept straight ahead as instructed. Instantly, there were two enormous bangs, so loud and so unexpected that they completely stunned my senses. The road I had expected to travel was a one-way street in the wrong direction. A traffic island, unpainted, unlit, and made of the same material as the road itself, was meant to divert traffic. It did not divert me, but it did blow two of my tires (numbers six and seven of the trip). Instantly, a red-faced policeman appeared beside me blowing his whistle vigorously. Within moments, a small truck with a canopy over the back appeared on the scene with four or five more police. Two in the back had rifles, typical of police in Central America. The words “Investigación Criminales” were emblazoned on the back of the truck. With up to eight policemen now surrounding me and my car, a prostitute apparently intent on consoling me was gently but firmly asked to move on. Prostitution is legal in Panama. A woman came out of a casino, attracted by the initial hubbub, to offer sweet black coffee. Later, she or another handed me a Coke. Though I normally drink neither, both were delicious! The police called a tire shop and a truck eventually arrived. One tire was taken away for temporary repair, and the other replaced by the spare. Several hours after arriving in Panama with a bang, a cavalcade consisting of the tire truck, the police truck and my car proceeded along mean back streets to the tire shop. Perhaps it was the only place open, or perhaps prices were excellent, but in any event, it was a beehive of activity way past midnight. There was no modern equipment, such as a hoist or machine for balancing. Everything was done with brute strength if necessary. And somehow, the tires were balanced. And of course, there were the deals and the offers, if I would come back tomorrow and buy a new rim and two more tires. Oh, and could I arrange to import shipments of used tires from North America? The police were not yet finished with me. They canvassed half the hotels in town looking for a room. This was the weekend before Panama’s 100th birthday celebrations and the hotels were filled. I was left with handshakes all around and not a single request for cash. Used by now to other police in Central America, I was impressed. From that night on, Sub-Lieutenant Tony Carrera, one of the group, attached himself to me as a self-appointed protector. The fact that I would venture out of the hotel after dark gave him nightmares. And in a mixture of English, Spanish, a finger drawn across his throat, and pss pss hisses that sounded like leaking tires, he managed to convey danger at every turn. It did not take long to realize that there was more paranoia than truth in some of his statements. Panama is a safe city, although there are places and situations that should be avoided by foreigner and local alike, just as there are in any city. 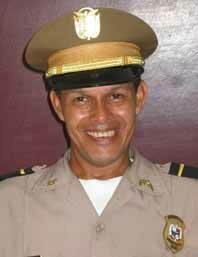 But today, in peaceful, free Panama, 15 years after former president General Manuel Noriega’s arrest by American forces, the police are generally friendly and helpful…and if they look for handouts, they have yet to get one from me.